Vacumetal specializes in surface treatment for the production of caps, jars and other packaging material for the cosmetics industry. This is mainly done by UV coating and lacquering in the production facility in Oosterhout. Employees of nearby offices expressed their concerns about the emission of fumes by Vacumetal and they feared heath issues. Vacumetal asked Actiflow to perform a study of the dispersal of contaminants such as exhaust fumes from the production process. 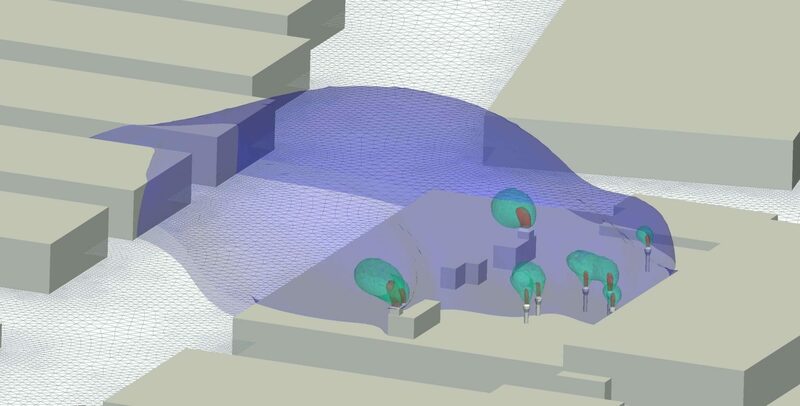 We made a CFD model to capture the physical environment and the physics of the exhausts. The CFD simulations showed various wind directions and wind speeds. The visualizations we made showed the concentration of contaminants near the offices. The results were translated into measures and their effect was studied in additional simulations. In the end, the concentrations near the neighbouring offices were lowered to an acceptable level.